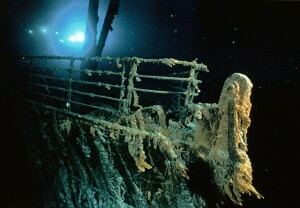 The sinking of the Titanic is a historical event full of facts and shrouded in a great deal of mystery. Many tell of captain Smith receiving an iceberg warning before tragedy struck and some even believe that if the ship had met the berg head on it could have avoided sinking. Unfortunately, the truth is that the disaster occurred and many lives were lost as a result. But where did the Titanic sink? On her maiden voyage from Southampton, England, to New York, USA, the Titanic was moving at a decent clip powered by her 16,000 horsepower turbine engine. Thought to be unsinkable, the vessel was the largest passenger ship over her time and was built with sixteen watertight compartments designed to close should the hull be breached. Passengers were treated to the finest in luxury accommodations and the maiden voyage included some of the most famous and wealthy figures of the time period. 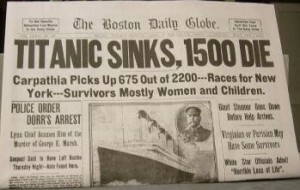 According to crew members, there had been a message of iceberg warnings within the North Atlantic, but that did not slow down the ‘unsinkable Titanic’. Continuing its rapid pace, the ship sailed full steam ahead toward its North American destination. 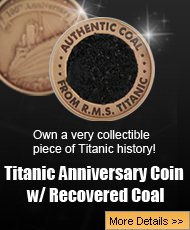 At approximately 11:40 pm on April 14, 1912, the ship struck an iceberg. The nature of the collision resulted in a glancing blow to the side of the ship, tearing a large gash in the ship’s hull, thus causing the loss of a number of rivets which held the ship together. Water immediately began rushing into the watertight compartments flooding five of the sixteen, which is more than the designer had expected. He told the captain that the sinking of the ship was a certainty and the crew began ushering passengers to lifeboats. The famous lack of lifeboats aboard the Titanic prompted the “women and children first” rescue etiquette. After a frantic scramble to get passengers onto lifeboats, the ship began to split in half and descend into the Atlantic. At approximately 2:40 am on April 15, 1912 the ship fully sank and 1,517 lives were lost. The Titanic’s final resting place was 13 miles southeast of her last distress call, about 350 miles off the coast of Newfoundland, Canada. The distance between the location of the final distress call and where the ship actually sank was a problem when it came to locating the wreckage of the ship. It wasn’t until 1985 that the Titanic was discovered at a depth of 2.5 miles (12,600 feet, to be exact). A noticeable aspect to the wreckage was that the ship had been torn in half and each section was facing opposite directions. The bow had planed off while sinking and landed relatively gently while the stern plummeted violently and had been torn apart due to implosion from the pressure of the water. Upon inspection of the wreck many questions were raised as to factors for the disaster. It was discovered that many of the rivets used to hold the ship together contained a large amount of slag iron which could have become brittle in the cold waters of the Atlantic. Many believe that because the hull buckled and the rivets popped out that the weak construction may have been a key factor to the sinking of the ship. The lack of lifeboats aboard the vessel also contributed to the magnitude of the tragedy and more stringent standards were put in place to avoid similar disasters in the future.